書 is an ideogrammic compound, or associative compound, a type of Chinese character consisting of two or more parts with similar or different meanings combined to create new characters. The character 書 comprises two parts. On the top is 聿 (yù), the radical/character for a writing instrument, such as a pen or brush. It is a pictogram that depicts a hand holding a brush. On the bottom is 曰 (yuē), the radical/character that means to say, speak, or utter. It is an ideogram that represents the idea of speaking, through a picture of a mouth with an indicator mark inside pointing to the source of speech. Together, the two components convey the idea of writing down what is spoken, as in the creation of a book. 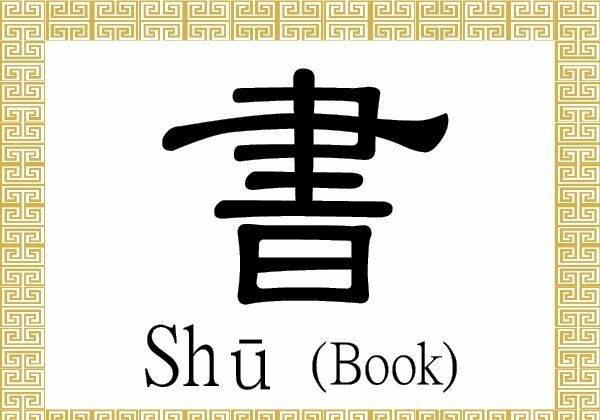 Examples of terms that use the character 書 include 書法 (shū fǎ), calligraphy or the art of penmanship; 辭書 (cí shū) or 辭典 (cí diǎn), a dictionary; 誓書 (shì shū), an affidavit, where 誓 (shì) means an oath or a vow; and 書畫 (shū huà), calligraphy and painting, where 畫 (huà) refers to a picture, painting, or drawing. 教科書 (jiào kē shū), a textbook, literally means a book (書, shū) for teaching (教, jiào) a subject (科, kē). 念書 (niàn shū) means to study or to read a book aloud, while 讀書 (dú shū) refers to reading, studying, learning, or attending school. 書中自有黃金屋 (shū zhōng zì yǒu huáng jīn wū) states that “inside books you will naturally find houses made of gold,” advising people that through studying they will naturally gain success. 書到用時方恨少 (shū dào yòng shí fāng hèn shǎo) states that “with books, when you need them you will regret that you have too few,” or it is only when you need to use what you have learned will you regret how little you have learned.